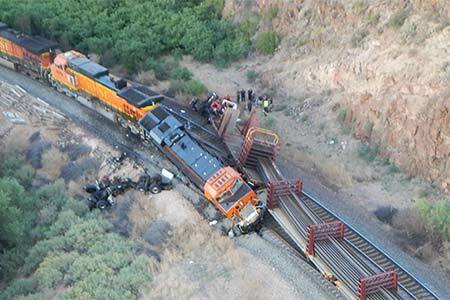 Truxton, Arizona—Two freight trains with the Burlington Northern Santa Fe Railway collided in rural northern Arizona on Tuesday, killing Walter Erickson, age 63, of Lenexa, Kansas. Matthew Thompson, age 26 of Salem, Missouri, sustained serious injuries in the collision. Both were employees of Herzog Railroad Services, Inc. Although Mr. Thompson suffered significant injuries, he now is in stable condition. According to the Mohave County Sheriff’s Office, the accident occurred near the small town of Truxton, Arizona. One of the freight trains sustained significant front end damage. The other, which was carrying maintenance equipment, derailed. The collision resulted in closure of the railway’s main double-track southern line. The National Transportation Safety Board will investigate. We extend our condolences to Mr. Erickson’s family and friends at this time of great loss for them and we wish Mr. Thompson a swift recovery.